Basketball legend Lynette Woodard, center, works with a group of young players during a Rule 13 basketball camp Wednesday at Bishop Seabury Academy. Surrounded by young girls reciting her catch phrases that drive home basketball fundamentals in the gymnasium at Bishop Seabury High, site of her camp, Lynette Woodard took a moment to reflect on when she was a little girl of 5, living in Wichita, spending so many of her days playing with her friend. Then a plane crashed on the other side of Piatt Street from Woodard’s home. Tracy Randolph, her best friend, was one of 30 people to die Jan. 16, 1965, the day of the worst aviation disaster in the city’s history. Ten homes burned to the ground in the blaze created when a KC-135 refueler that had taken off from McConnell Air Force Base crashed and sprayed fuel over numerous homes. Lynette was the only one not home when the crash occurred. She said she always wanted to do what Tracy did, and since Tracy was spending the night at her grandma’s house across the street, Lynette spent the night at her grandma’s house in another neighborhood. Through the years, the particulars of her friend’s face faded in Woodard’s memory, until a few years ago, reading a story looking back on the tragedy, she saw Tracy’s photo in the paper. Woodard said that as part of a Model Cities Project that replaced vacant lots with parks — in this case the land where the houses that burned down had been — she had a place nearby to play basketball. Finding a game often wasn’t as easy as finding a place to play for Woodard, who turned 50 last Aug. 12. Her brother two years her senior was her ticket to competition, but that didn’t always gain her admission. Her love of the game, head for it and physical gifts took care of the rest. “I guess I started feeling better when I started getting picked early, or made a free throw to be able to pick my own team,” Woodard said. The kindness of a man named John Winslow also played a part in her development. Woodard smiled her trademark smile at the memory. “Once I had my own ball, when the guys told me to go home, I would say, ‘OK. I have to take my basketball.’ That’s when I learned about ownership,” she said. That act of kindness, the gift of a basketball, is passed forward over and over by Woodard. Every camper at Seabury was given a basketball, many of which were brought to Woodard for her autograph. 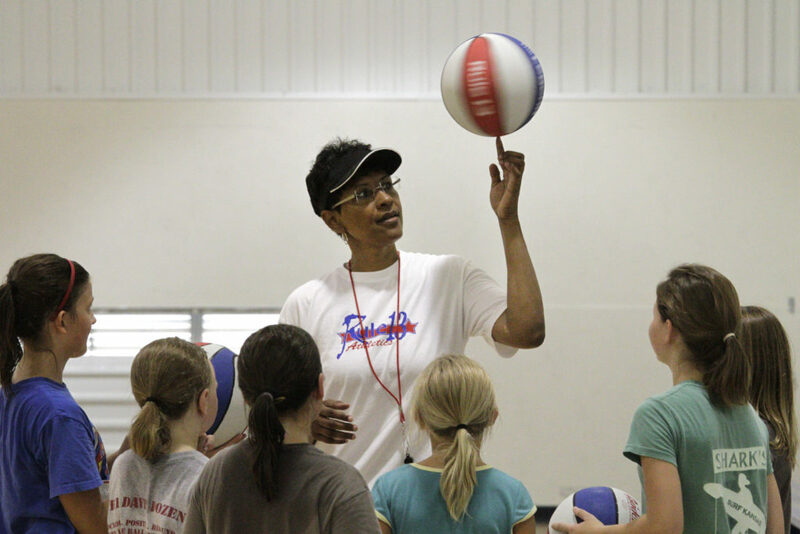 “That’s why I always give basketballs,” said Woodard, the leading scorer in the history of Kansas University basketball, a gold-medal winner in the 1984 Olympic Games and the first woman to play for the Harlem Globetrotters. 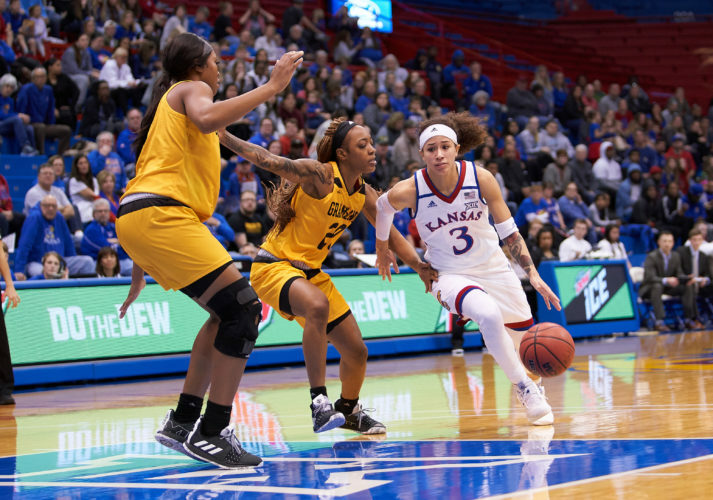 Now residing in Lawrence, Woodard and Deborah Newkirk, who like Woodard was an assistant to former KU women’s coach Marian Washington, have formed “Rule 13 Athletics.” The tandem will put on camps, clinics and tournaments and can be contacted at their website, rule13athletics.com. “So people will ask, what’s Rule 13?” Woodard said. The number is a transposed version of the one she made famous. Cheryl Miller wore No. 31 because that’s what Woodard wore, and Reggie Miller wore No. 31 because his sister Cheryl did. Becky Bridson, entering her second season as Seabury’s girls basketball coach, couldn’t believe her fortune to have Woodard in the school’s gym, conducting a camp open to all comers, not just Seabury students. Newkirk and Woodard stress the fundamentals by keeping it simple. Woodard asks the girls how to shoot a layup. “Low and hard, high and soft,” camper Regan Zaremba responded quickly. Woodard shared a pet-peeve of hers. “We teach how to pass, but nobody teaches how to catch,” she said. How do you catch, she asks the campers? “Block and tuck,” they answer, putting their right hand forward and the left hand to the side. Woodard doesn’t teach shooting the ball, she explained, she teaches stroking it. “Stroke, you feel,” she said. To keep it interesting for the campers, Woodard will roll the ball up her arms, spin it on her fingers, turn her back to the basket at halfcourt and hit a shot without looking at the target. That’s for giggles. To make the players better, she brings them back to the basics. Woodard can still make music with a basketball in her hands, but she chooses to conduct a symphony of youngsters. “It’s their turn,” she said spreading her arm out in the direction of a group of campers who seem thrilled to be in the presence of a woman who can do things with a basketball they didn’t know were possible, things they now dream of one day doing themselves.